Due to his dedication to the army, he became the official mascot of the 3rd Transvaal Regiment and was taken everywhere with the soldiers. You’ve heard the story of Jack, the baboon who worked as a perfect train signal conductor in South Africa, but it may surprise you to know that Jack was not the only baboon employed by the country. 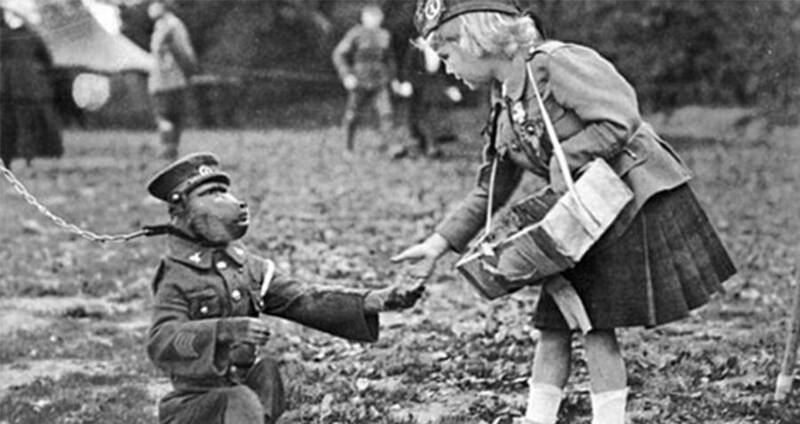 The baboon was Jackie, a Chacma baboon just like Jack who served in the 3rd South African Infantry Regiment during World War I.
Jackie the baboon, started out, much like Jack, as a pet to a man named Albert Marr. Marr found Jackie wandering around his farm and decided to take him in and train him as a member of the family. As one does. 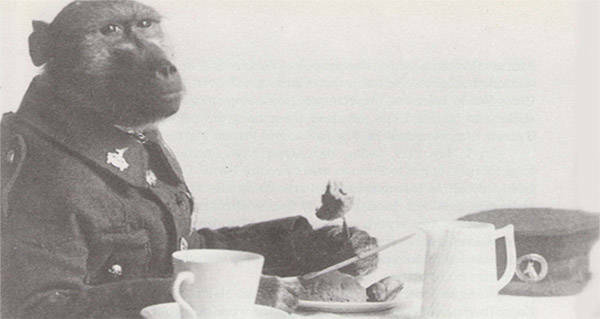 Jackie lived with Marr for several years, learning how to be a respectable young baboon. Then, in 1915, Marr was enlisted to join the war. Unwilling to leave Jackie behind, he asked his superiors if Jackie, too, could join the army. Much to everyone’s surprise, they said yes. Once he was enlisted, he was treated just like all of the other soldiers. He was given a uniform, complete with buttons and regimental badges, a cap, a pay book, and his own set of rations. Due to his dedication to the army, he became the official mascot of the 3rd Transvaal Regiment and was taken everywhere with the soldiers. He spent time in the trenches in France and was even wounded by enemy fire. During an explosive shootout in one of the trenches, Jackie was seen building a wall of stones around himself for protection. While he was preoccupied, a piece of shrapnel flew over his wall and hit his right leg. The regiment’s doctors took Jackie via stretcher to the camp’s hospital and tried to save his leg, but unfortunately, it had to be amputated. Due to being knocked out with chloroform, and the unknown effects of chloroform on baboons, the doctors were not confident that he would recover. However, within a few days, Jackie had done just that. For his bravery, Jackie was awarded a medal for valor, as well as promoted from private to corporal. Eventually, near the end of the war, Jackie was discharged at the Maitland Dispersal Camp in Cape Town. He left with his discharge papers, a military pension, and a civil employment form for discharged soldiers. Like a true friend, Jackie returned to the Marr family farm, giving up his life of service for a life of leisure as a pet, until his death in 1921. 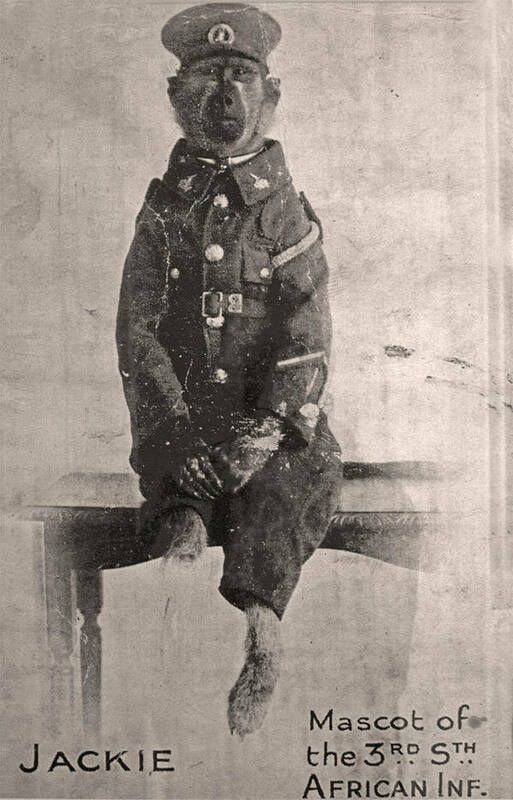 To this day, Jackie the baboon is the only baboon to have achieved the rank of Private in the South African Infantry, as well as the only baboon to fight in World War I. Enjoy this article on Jackie The Baboon? Next, read the story of Jack, the train conducting baboon. Then, read about the world’s most decorated dog soldier, Sergeant Stubby.